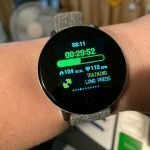 Well the full review will be coming but I wanted to share my first tests of the Ticwatch Pro because I know many people considering purchasing it are asking these questions. 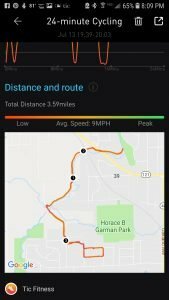 Well, after spending two full days with the Ticwatch Pro and putting it through four separate GPS tests I can say that the built-in GPS has certainly improved over the Ticwatch E and the Ticwatch 2. The Ticwatch Pro has a true stand-alone built-in GPS. Yes, you can leave your phone behind if you want to, although how many people do that these days? 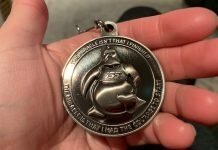 More likely, you’re probably like me and still bring your phone everywhere you go but don’t want a smartwatch with a built-in GPS using your phone’s resources to do something it should be able to do on its’ own. After all, my Ticwatch E and Ticwatch 2 also have a built-in GPS but still require being connected to my phone to function properly. 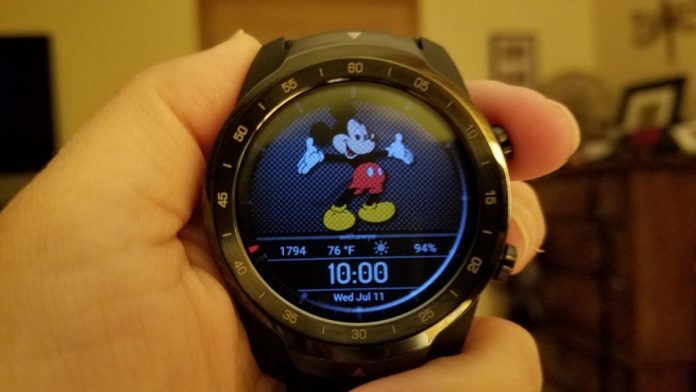 The Ticwatch Pro is different. Its’ built-in GPS works truly by itself but you’ll need to turn location off on your phone or it will still try to use it. Why is it better? There isn’t much information on the full specifications of the Ticwatch Pro yet so I don’t know if there’s been a serious hardware upgrade but I do know that it has access to more satellites including GPS, GLONASS, Beidou, and Galileo. Whatever the case, the GPS is much better and that’s all I care about! I’m amazed at how quickly it finds my location. It has been connecting almost instantly. 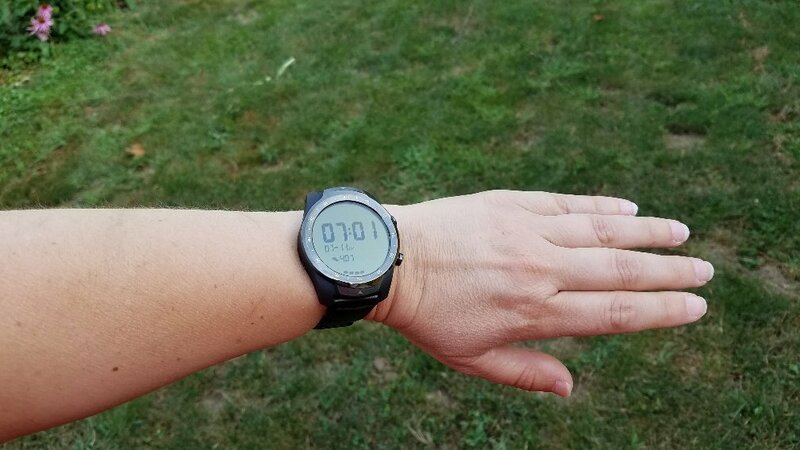 It’s on par with the Garmin Fenix 5s and actually might connect just a little bit more quickly than the Fenix 5s. 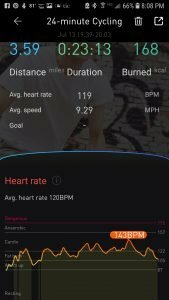 Also, the Ticwatch Pro and Fenix 5s have been testing out almost like identical twins, not only for their GPS distance estimates but also heart rate accuracy. 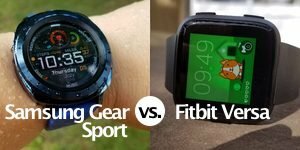 I’ll be testing the Pro against other watches too but I’ve been so surprised by how similar it is to the Fenix 5s in regards to GPS and heart rate estimates. 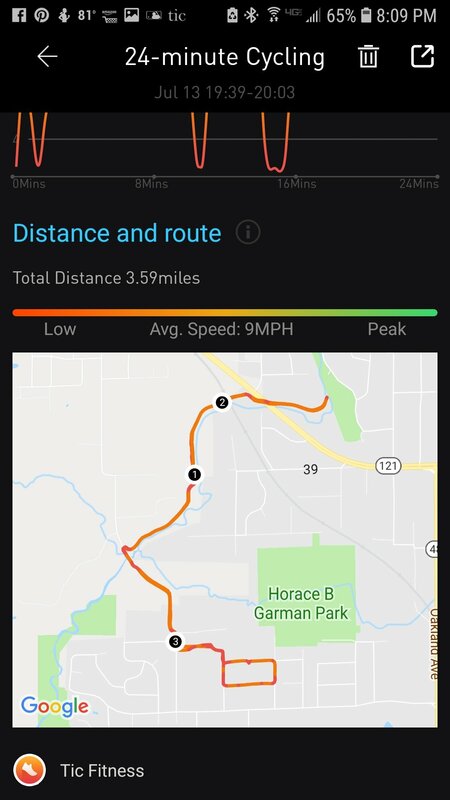 Ticwatch Pro map from bike ride. It nailed it! And I just mentioned heart rate accuracy. 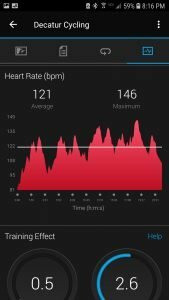 The heart rate sensor improved on the Ticwatch E over the Ticwatch 2 but the Ticwatch Pro is outperforming the E. I’m not seeing the erratic behavior in which the E sometimes showed a drop in my heart rate for a few minutes during workouts. When the Pro does drop, it corrects itself quickly but overall it has been very stable. 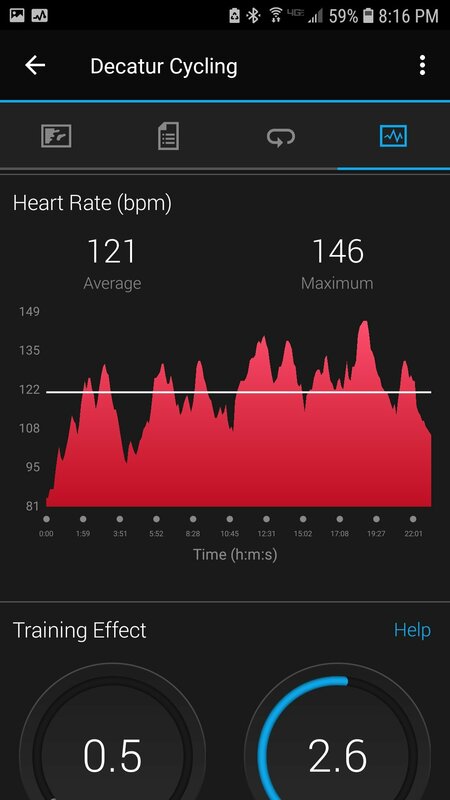 I’ll need to test the heart rate sensor more but it looks like there’s been a noticeable and welcome improvement in the optical heart rate sensor too on the Pro. 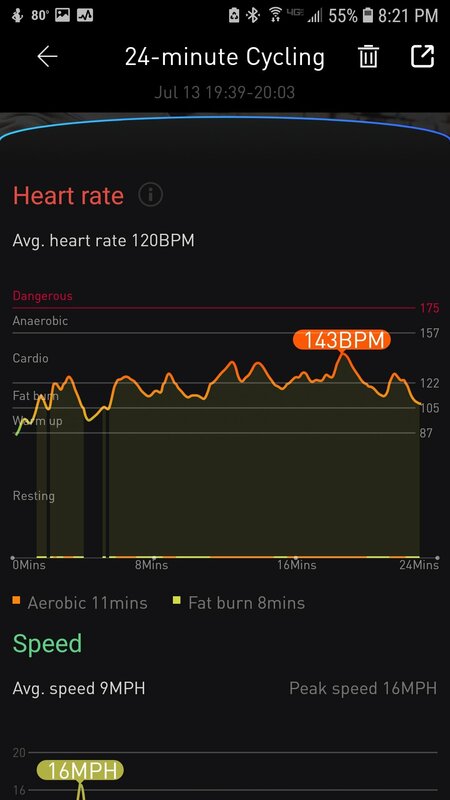 The Ticwatch Pro is also the first Ticwatch to offer 24/7 heart rate monitoring. 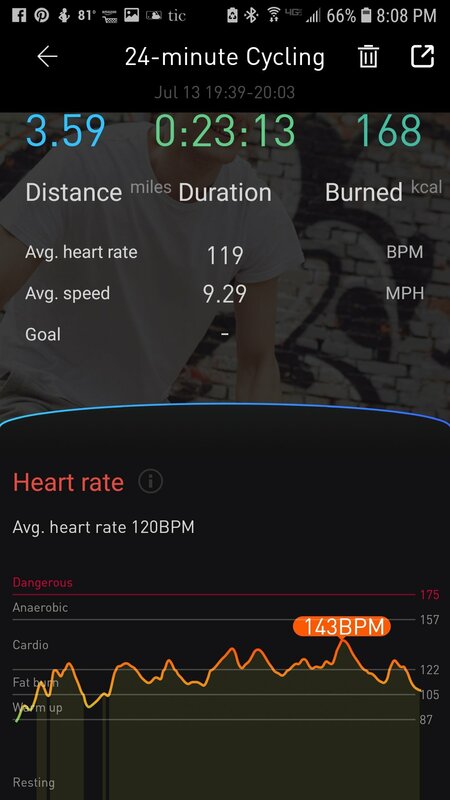 If you enable this feature, it will measure your heart rate, I believe every 10 minutes, and also estimate your resting heart rate from this information. 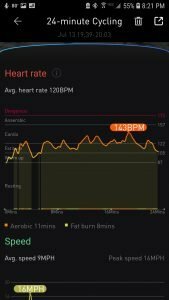 Having 24/7 heart rate monitoring turned on doesn’t seem to affect the battery life in any significant way. 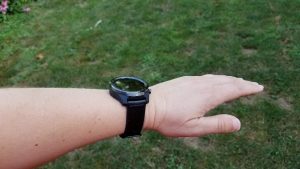 Below: Some pics of the Ticwatch Pro on my wrist. It is a large watch (45 mm in diameter) but not heavy. 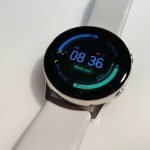 And speaking of battery life, this is the biggest selling point of the Ticwatch Pro but does it live up to the 5-30 days claim? Well, I haven’t had it 30 days to test whether it will last that long in essential mode but 5 days for the way I use the watch wouldn’t be possible but I’m still happy with the battery life on the Pro. Essential mode means that Wear OS is turned off as well as the Bluetooth connection to your phone. 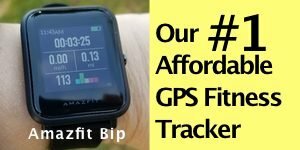 You’ll only have access to the LCD screen which shows the time, date, your steps, and heart rate (heart rate only shows when you press the bottom button). You won’t receive notifications in essential mode because Bluetooth is turned off but it certainly conserves battery life. Tip: To easily place the watch in essential mode, press in the bottom button for a few seconds until the screen to place the watch in essential mode appears. You can also access essential mode in the main menu of the watch where all the apps are displayed. To turn off essential mode, press in the power button for a few seconds. It will then take about a minute for Wear OS to power back up. Here’s a snapshot of today to give you an idea of how the battery performs. 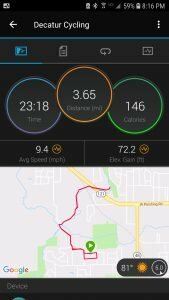 Now, normally I would not be doing this many GPS workouts in one day but since I’m currently testing the watch I’ve been putting it through its’ paces. The only thing I’ve done to possibly conserve battery life is turn off tilt to wake. I didn’t do this for the battery life but rather I found it too sensitive. The screen would come on with just the slightest twist of my wrist and with the always-on LCD screen showing the time and my steps, I really didn’t need the main AMOLED screen turning on that often anyway. 2:00 PM 80% Used the GPS twice for approx 40 minutes total. 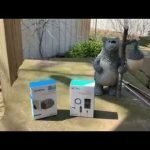 Answered a phone call through the watch using the mic/speaker. Responded to 5-6 text messages by voice. Received a half-dozen other notifications. 9:15 PM 60% Sitting here typing up this article. 9:50 PM 60% Still typing up this article! So, looking over the data, it looks like the Ticwatch Pro uses about 2-3% of the battery every hour and that’s when receiving notifications here and there and not trying to conserve the battery using essential mode. On a normal day, I’d only be using the GPS once, unless I decide to use the gym that day. So, if the battery is only dropping by about 2% an hour with Wear OS still running in the background, the watch is easily going to make it through 24 hours with a little over half the battery life remaining. Even after almost 12 hours and putting it through 3 separate GPS workouts I still have 60% of the battery left as I type this. Using essential mode at night when I’m sleeping only drains the battery by about 3% over a 7-8 hour period. Realistically, if you’re using the watch with Wear OS running in the background, you’re probably going to be able to get 2 days out of it fairly easily. If you use essential mode to conserve the battery at night and at times during the day you could extend that to 3-5 days. It just depends how you use the watch. 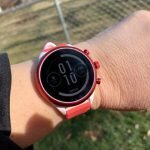 The bottom line is that the battery life is good with the Ticwatch Pro, considering that it is a full-featured smartwatch and fitness tracker with all the bells and whistles. 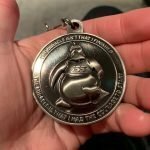 So, I’m happy with the test results. 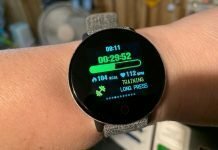 The Ticwatch Pro has so far performed well on the three things that mattered most to me: GPS performance, heart rate accuracy, and a battery that makes the watch practical to use in my real life daily routines. And we haven’t even discussed all the other cool things it does yet. 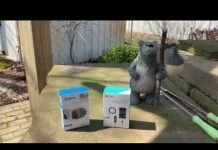 That will be coming in the full review but I wanted to share these first test results with you because it takes a while to put together a full review and produce a video for a product like this. There’s so many features to try out and test. When the full review is ready, I’ll link to it in this article.